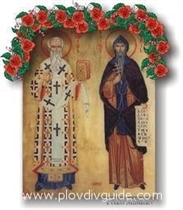 Ever since the earliest Bulgarian manuscript books (preserved until today), we can trace the tradition to honor the two saint brothers - St Cyril (on February 14th) and St Methodius (on April 6th) as authors of the Bulgarian Alphabet. The earliest church celebration of both saints together, on May 11th each year, goes back to the 12th century. During the Revival period those church celebrations on May 11th developed into a large secular celebration of Bulgarian knowledge and culture. It was Naiden Gerov who organized the first celebration of May 24th, 1851 in Plovdiv, as the Day of the St Cyril and St Methodius, to honor all achievements of Bulgarian language and culture. A lot of people today, who were named after the two saints, celebrate that day as their name day. The name Cyril means lordly in ancient Greek, while Methodius means the one following a method, or doing a study. The two brothers, Sts. Cyril and Methodius (or Constantine and Methodius) - known as the Apostles of the Slavs, were born in Thessalonica, in 827 and 826 respectively. Though belonging to a senatorial family, they renounced secular honours and became priests. They were living in a monastery on the Bosphorous, when the Khazars sent to Constantinople for a Christian teacher. Cyril was selected and was accompanied by his brother. They learned the Khazar language and converted many of the people. Soon after their Khazar mission, came the invitation of the Moravian Prince Rostislav, who sought missionaries able to preach in the Slavonic vernacular (peoples) language, and thereby check German influence in Moravia - the Moravians wished a teacher who could instruct them and conduct Divine service in the Slavonic tongue. On account of their acquaintance with that language, Cyril and Methodius were chosen for their work. In preparation for it Cyril invented a new alphabet and, with the help of Methodius, translated the Gospels and the necessary liturgical books into that new South Slavonic language. They went to Moravia in 863, and laboured over the translations for four and a half years. The immediate success aroused the hostility of the German rulers and ecclesiastics. Cyril died in Rome, 4 Feb., 869. Methodius went to Constantinople and with the assistance of several priests he completed the translation of the Bible and ecclesiastical books into Slavonic. The enemies of Methodius did not cease to antagonize him. His health was worn out from the long struggle, and he died 6 April, 885, recommending as his successor Gorazd, a Slav who had been his disciple. Methodius influence in Moravia was wiped out after his death but was carried to Bulgaria, Serbia, and Russia, where the Southern Slavonic language of Cyril and Methodius is still the liturgical language of churches and they all use, with variations, that same alphabet as the basis of their languages.